It is fair to say that without Hinge & Bracket there would be no Lady Crabtree. of the highly talented performers George Logan and Patrick Fyffe. 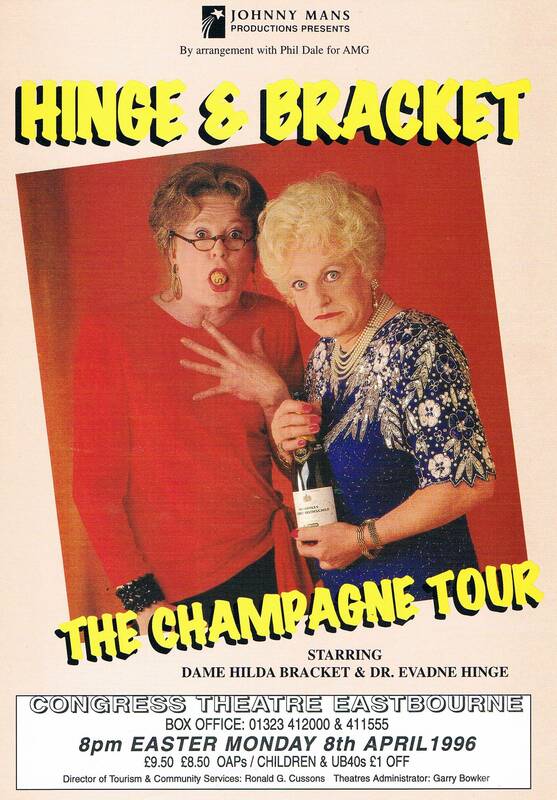 As Hinge & Bracket they entertained worldwide on stage, radio and television between 1972 and 2002. They were so much more than actors and comedians. 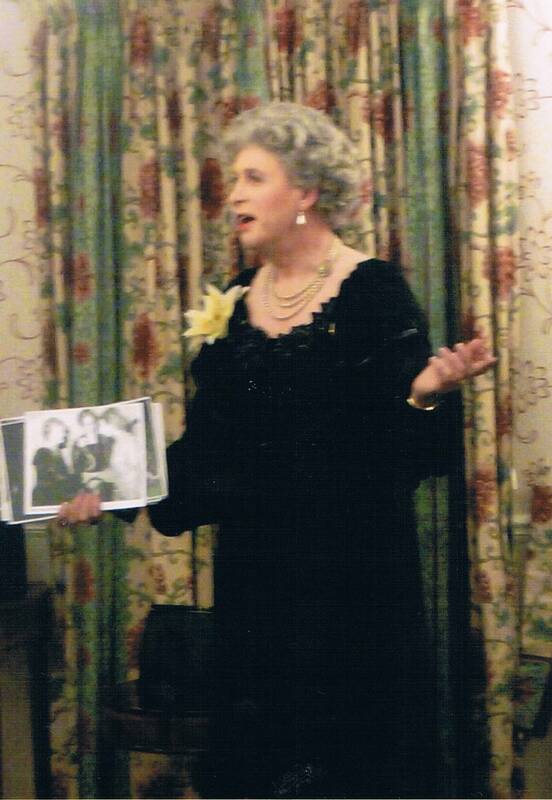 As skillful musicians and singers, Dr Evadne accompanied the operatic Dame Hilda on the piano, and they were as happy singing the works of Ivor Novello and Gilbert & Sullivan in regional theatres as they were performing operatic arias at the Royal Opera House Covent Garden or the Barbican, and charmed audiences with their genteel humour. Their career had so many facets. On radio they brought audiences into their Stackton Tressle home in long-running series such as "The Enchanting World of Hinge & Bracket", "The Random Jottings of Hinge & Bracket" and "At Home with Hinge & Bracket". 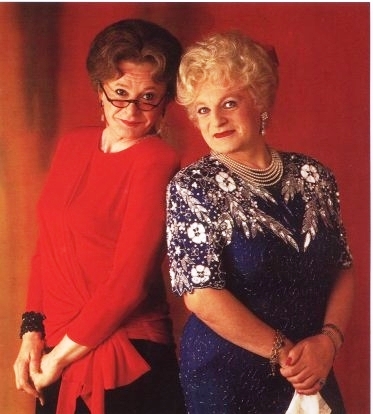 They guested on hundreds of TV programmes from Pebble Mill at One to The Les Dawson Show and The Good Old Days; presented their Gala Evenings and concerts for BBC TV, and appeared in three series of their much loved sitcom Dear Ladies. On stage their shows included Sixty Glorious Minutes, Hinge & Bracket at The Globe, An Evening of Memories, The Tranters Are Coming, The Champagne Tour, The Wimbledon Proms, and Tea and Trumpets with the Grenadier Guards. They took part in many royal shows, including Royal Variety Performances, and toured in plays such as The Importance of Being Earnest and Lettice and Lovage. 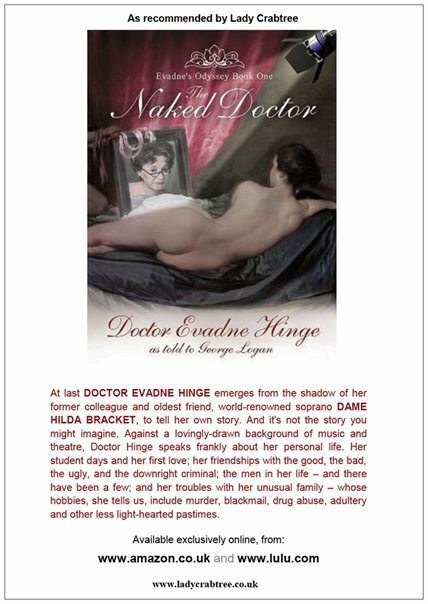 Pantomime, TV Quizzes, Chat Shows....Dame Hilda did a one-woman show "By Kind Permission".... Dr Evadne played Miss Marple in "Murder At The Vicarage".... you name it, they did it! Throughout 30 years of entertaining, the overriding impact was that their characters were SO convincing that to this day many people still believe that those dear ladies were real. It was this facet that appealed to Paul James - who first saw Hinge & Bracket perform live in the summer of 1976 and then attended their shows at every available opportunity over the next 25 years, seeing them live in Bournemouth, Chelmsford, St Alban's, The Barbican, Wimbledon, the London Palladium, Hastings, Brighton, Eastbourne... and at various other towns and cities across the country. He worked with them at the Oxford Playhouse and met Patrick Fyffe on many occasions, once spending a glorious afternoon of theatrical reminiscenses at Patrick's house in Keswick Road, Putney. 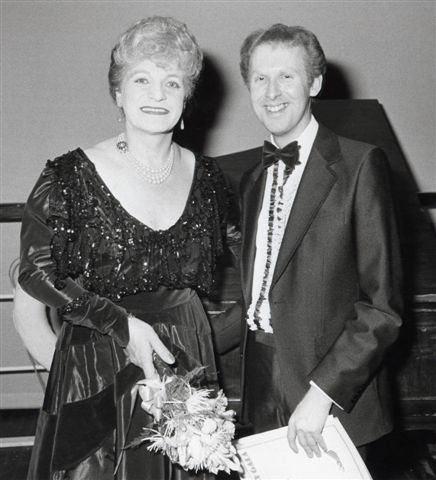 In 1985 Dame Hilda Bracket wrote the Foreword to Paul's book Excuses, Excuses... and contributed to his other works whenever possible, giving anecdotes for Great Theatrical Disasters and always sent a recipe or bon mot for any charity book. 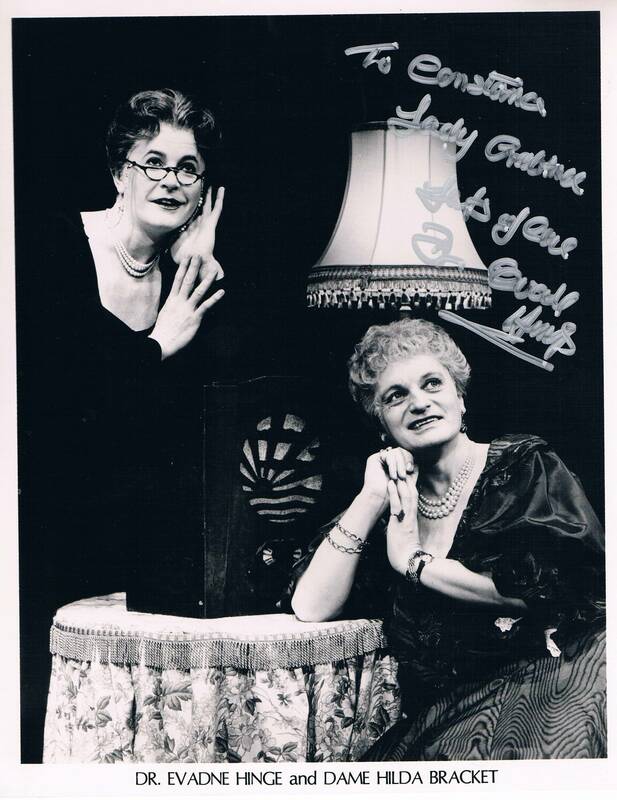 Lady Crabtree's first appearance on stage in July 1978 was inspired by Dame Hilda, although as the Lady C act developed across the years there was a very conscious effort to make her as individual as possible. 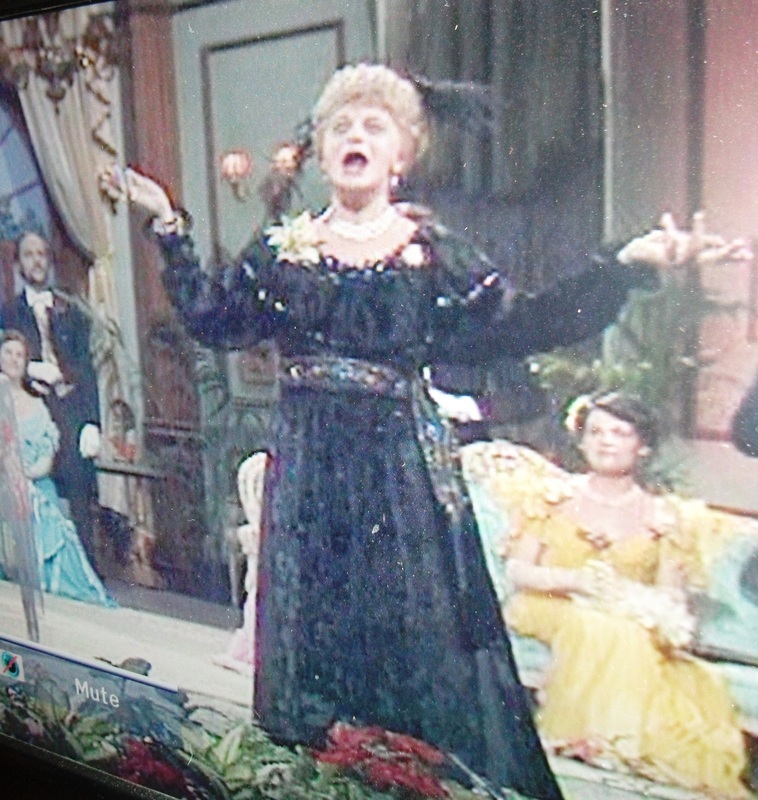 Although both formidable women, Lady C has rarely sung in public and so there was no rivalry! 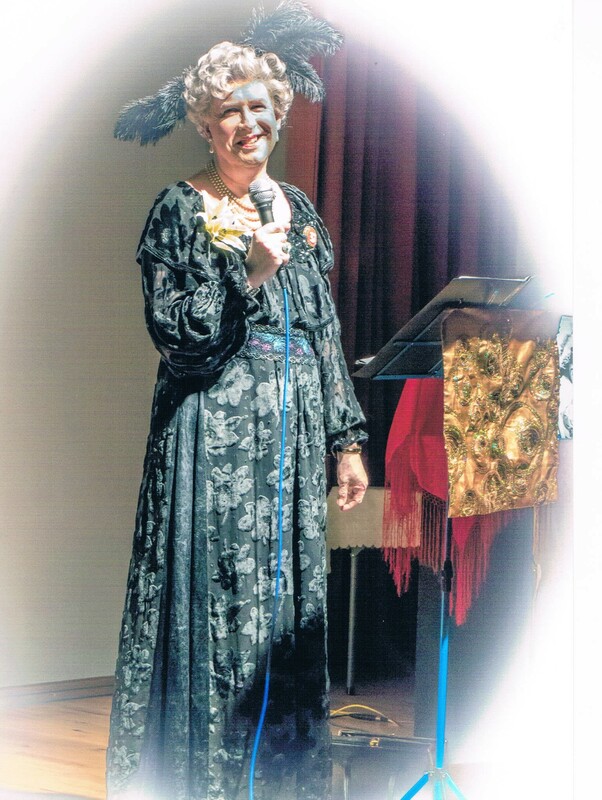 The greatest thrill today is that so many audience members believe that Lady Crabtree is real .... and the ultimate accolade came after a recent performance when an elderly lady from Wales said, "You know, you remind me of Dame Hilda Bracket." There can be no greater compliment. and at Covent Garden in a musical tribute to Dame Eva Turner. 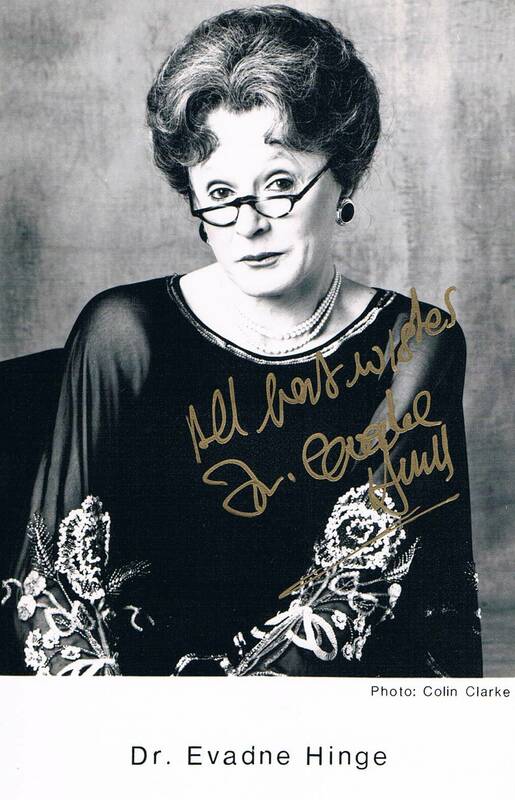 Lady Crabtree is pleased to play her own small part in keeping the memory of Hinge & Bracket alive. 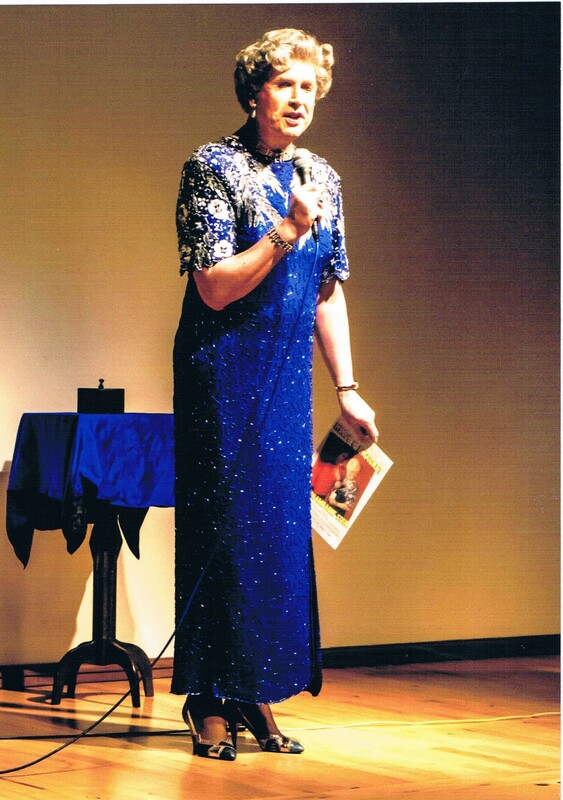 She regularly mentions the duo in her performances and is delighted that audiences seem thrilled to have an opportunity to see Dame Hilda's gowns when she occasionally wears them on stage .... in fact the dresses get an ovation each time they appear. Hopefully Dame Hilda would approve.